1. How did AFH’s collaboration with the National Hockey League (NHL) come to be? George, our Community Network Director, has been working on bringing this project to fruition for over two years. This was a particularly fitting time for the partnership because the National Hockey League (NHL) wished to honor former professional hockey player and current NHL Diversity Ambassador, Willie O’Ree, on the 60th anniversary of his NHL debut. 2. Why did the NHL choose to celebrate Willie O'Ree, in particular? Sixty years ago, Willie O’Ree became the first black player in the National Hockey League. He is currently the NHL’s Diversity Ambassador and has dedicated his career to using the League’s influence to drive positive social change and foster more inclusive communities through his Hockey is for Everyone™ initiative. It is for this reason that the National Hockey League hired us to design a graphic banner that would set the scene for honoring former NHL player, and longtime mentor, Willie O’Ree. 3. Tell us about the design process for this particular project. After meeting with the NHL to learn about their vision, we began our process by researching the life of Willie O’Ree, his career as a hockey player in the NHL, and his contribution to the community by fostering diversity in hockey. We used everything we learned as background for the visual elements. By sourcing a number of archival photographs of Mr. O’Ree playing in the NHL, along with recent photographs of O’Ree working with young hockey players, we came up with a collaged layout celebrating his inspiring story. A really important design element is Mr. O’Ree’s quote, “If you think you can, you can. If you think you can’t, you’re right,” because it speaks to the power of cultural visibility as well the importance of personal perseverance. 4. What were some of the challenges the Graphic Design team faced with this project? The challenge for any wall graphic is always anticipating how your design will translate from your small notebook and computer screen into a printed piece spanning a large area. In this case, our design needed to span an area of ten feet—so that was really important to keep in mind. 5. What was the most exciting part of this project, for you and for your Studio? The opportunity to participate in the unveiling of the AFH-designed Willie O’Ree banner at the press conference was very exciting. In any project we do, we put lots of thought and effort into how we can best convey each client’s vision. 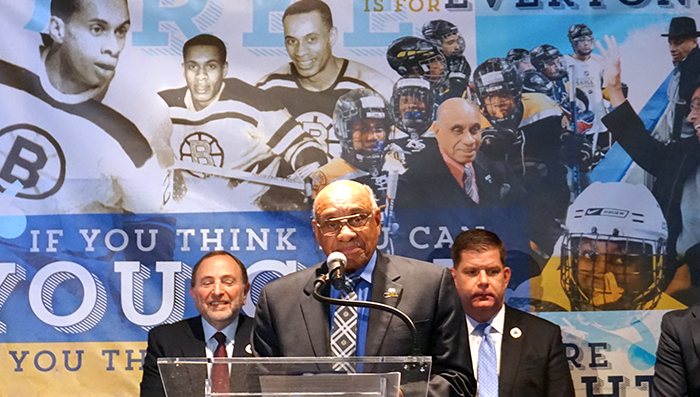 When we entered Legends at the TD Garden, we met Willie O’Ree and explained how proud we were to help honor him, as his mission aligns with ours in terms of bringing diversity to our communities. The graphic was on all of the TV screens and printed large enough to really set the stage for the event. 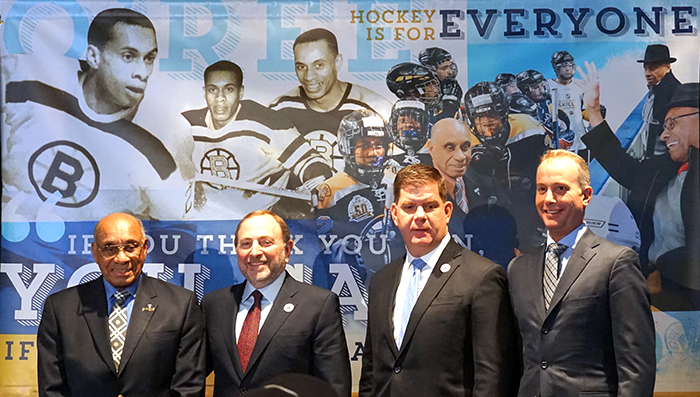 Watching Mayor Walsh officially proclaim January 18 as “Willie O’Ree Day’ and, along with NHL Commissioner Gary Bettman and Bruins CEO Charlie Jacobs, honor Willie O’Ree in front of our work was a rewarding moment for our design team. 6. Were you surprised by the choice to expand the project's reach nationally? Why or why not? I was more proud than surprised to hear that our work is going to reach so many more people. It is rewarding to hear that the need for diversity in hockey is valued and celebrated not only in Boston, but also across state lines. 7. What did you enjoy most about working with the NHL? I’ve grown up in Boston as a Bruins fan so this collaboration has felt authentic to my experience as a fan. The magnitude of knowing that I can contribute to social change by designing for a franchise as large and respected as the NHL is truly humbling. 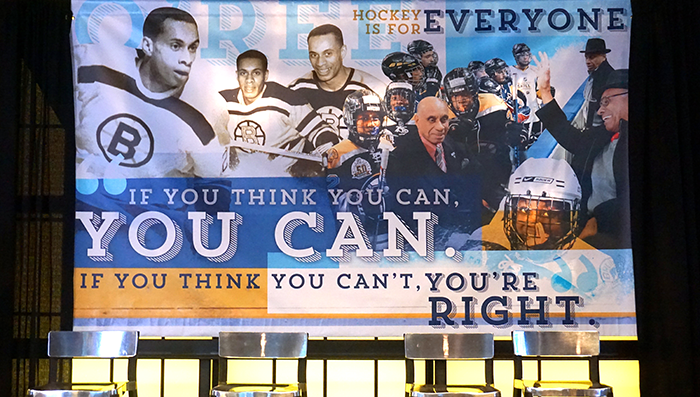 Our Graphic Design Studio’s artwork depicts Willie O’Ree’s first game in a Boston Bruins’ uniform, as well as O’Ree’s legacy of coaching and mentorship. One of O’Ree’s many contributions to increasing diversity in the field of hockey is a community mentorship program called Hockey is for Everyone™ which uses the game of hockey, and the National Hockey League's global influence, to drive positive social change and foster more inclusive communities. AFH’s design celebrates the program’s motto, “If you think you can, you can. If you think you can’t you’re right,” through a collage of archival photography and contemporary typography. 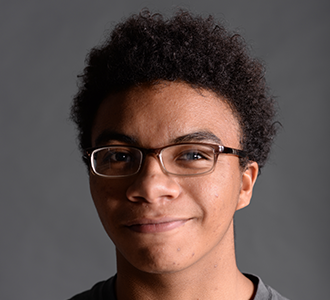 Here, we dive deeper into the project with AFH Graphic Design mentor Kelsey and Graphic Design participant Armani. 8. Why are projects like these important for the Graphic Design studio, and for Artists For Humanity as a whole? This project is a particularly appropriate collaboration because both AFH and Willie O’Ree’s missions align in that we are both creating opportunities for diverse communities—theirs through hockey and ours through art and design—and empowering young people. 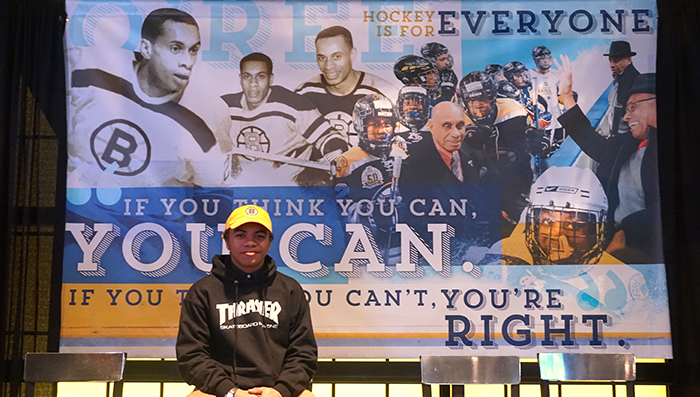 It was a great opportunity to inspire our teens by showing them the steps others, such as Willie O’Ree, the NHL, and SCORE [a youth nonprofit that is part of the Hockey is for Everyone™ initiative], are taking to advocate for social issues. The NHL project is a great way to inspire young people to be part of the solutions to the challenges they face. Creating awareness of these initiatives locally and nationally, along with the opportunity to have a seat at the table when discussing the social issues that affect our teens every single day, is invaluable. Plus, we love projects like these—wall graphics, environmental graphics, and banners—we really enjoy making spaces reach their full potential through design. 9. Why is promoting diversity important for the NHL, and for sports leagues in general? From our research, we found that the numbers of hockey players and hockey fans belonging to minority populations are very low. The Hockey is for Everyone™ initiative seeks to change that by creating more intentional spaces, fostering communities, and promoting better financial options (such as subsidizing the price of hockey equipment, which is often a prohibitive cost for low-income young people) to increase diversity in the sport. 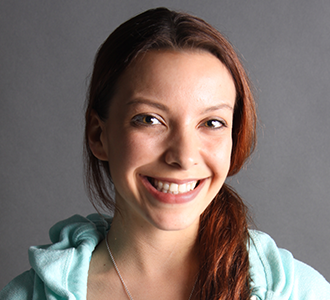 I've been working at AFH for a little over two years, previously in the Painting Studio and now in the Graphic Design Studio. 2. Why do you think the NHL chose to honor Willie O'Ree, in particular? Willie O'Ree, being the first black player in the NHL, broke race barriers for future players. I believe the NHL recognizes what that means, not just within hockey but within the world as a whole. Mr. O'Ree's entry into the NHL told many others who looked like him that this was one more thing that they were no longer going to be deprived of. 3. What was the biggest challenge you faced while working on the NHL Project? 4. What was the most rewarding part of working on the NHL Project? The most rewarding part of working on the NHL project was attending the press conference once it was completed. Usually, we create designs, the final product goes to the client, and we're on to the next project. This was the first time I had the opportunity to see one of our completed projects installed. Seeing how happy Mr. O'Ree was with the banner made it all the better, and the NHL even gave us free tickets to the game that night. That was cool! 5. Did you know AFH's designs will be displayed in skating rinks across the country? What is your reaction to that? I didn't know that, but that's really awesome! I hope the fact that it was made by a group of teenagers is somehow incorporated into the display of the design so that other teens will feel empowered to design, too. 6. 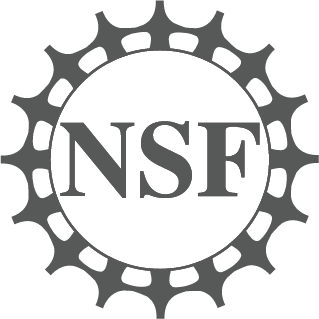 What has been your favorite project you've worked on since you started at AFH? Actually, the NHL project has been my favorite so far. I really enjoyed conveying the message through images and the research was fun as well. It was, and probably will be, the only chance I get to watch ‘sports highlights’ videos as research for a design! 7. What, in particular, have you learned from the Graphic Design Studio so far? Working in the Graphic Design Studio has taught me the importance of researching and understanding the problem in front of me before trying to find a solution. In our Studio, we try to look at a design challenge from every angle, not only so that we can find a solution but also so we can inspire an authentic emotion from the viewer with our designs.